Water connections Male nozzles to suit 12mm bore reinforced hose. The cold inlet incorporates a non-return valve. Water supply Maximum recommended pressure from pump 1.4bar (20p.s.i.) or from header tank 13m (40ft) head. NOT SUITABLE FOR DIRECT CONNECTION TO THE MAINS WATER SUPPLY. 87 gm/hr (3oz) when tiring. (5 gallons) of hot water. indicator lights, supplied with heater. each pole and fused at 5 amp. Pressure relief valve set at 3 bar and fusible plug Set at 96 0 C both venting onto burner. This heater must be installed by a competent gas fitter working to the Gas Safety (Installation and use) Regulations 1984, and as amended 1990, the Health and Safety at Work Regulations and these Fitting Instructions. In addition the installation of the mains electrics for the Cascade 2 GE must be carried out by a competent electrician working to the lEE Regulations 16th edition 1991 and these Fitting Instructions. For USER SAFETY attention is drawn to Section 4.1 i.e. Balanced Flue Terminal Position. The gas control circuit must only be connected to a 12volt dc. negative earth supply. Before commencing any work on the caravan disconnect the battery and isolate the caravan from the mains supply. Mains connection for the Cascade 2 GE should be made via a double pole switched outlet with a contact gap of at least 3mm in each pole. Water hoses should be reinforced, opaque FOOD QUALITY . Cascade 2 GE mains cable must be less than that recommended, i.e. 3 core (blue, brown and green/yellow) with a CSA of 0.75mm 2 . This heater does not contain asbestos or asbestos related products. Measurement Accreditation Service (NAMAS), and are manufactured to B.S. 5750 part 2 1987. The heaters are suitable for installation into caravans complying with B.S. 4626. 1970.
bulkhead to the left hand side when viewed from the rear. Choose a flat vertical wall without interference of trims etc. if possible. Ensure that any trims can be refitted or cut to make a watertight seal and a neat installation. Structural sections within the walls of the cara­van should be avoided for safety reasons. Temporarily tape the template to the inside wall at the position required. Ensure that the bottom of the template, i.e. the line CD, is to the floor or above any strength beam in the base of the wall. Mark the 'O' position through the template onto the wall. Remove the template and drill a 4mm dia. hole through the inner and outer walls at the '0' position. Ensure that the drill is kept square to the wall. The pilot hole drilled through the wall will allow the template to be positioned correctly on the outside wall Tape the wall template (see fig 4.) and align the 'O' position with the previously drilled hole. Ensure that the template is square to the caravan body. The line CD should be level with the caravan floor or above any strength beam on the base of the wall. Drill four 10mm dia . Holes at the positions A, B, C, & D as shown on the wall template. The drill should pass through the inner and outer walls. Using a jigsaw or padsaw cut to the lines shown on the template. (see fig 5) Remove all traces of the template and masking tape from the caravan wall. Before fining the timber lining first remove any insulation from between the inner and outer walls to the depth of the timber. The finished hole size should be 240mm x 212mm. Use a silicone sealant to seal the lining to the inner and outer walls. Secure the inner walls to the lining with panel pins. The panel pins should be fined within 10mm of the edge of the hole at the top and sides only. Trim the edges of the hole to remove any burrs etc. The use of silicone sealant is to prevent water from entering the walls and floor of the caravan. 9:0 240 VOLT CONNECTION (GE ONLY) Any work on mains electric should be carried out by a competent electrician working to the cur­rent IEE Regulations. Ensure the caravan is isolated from the mains supply before starting any work. The illumination double pole switched outlet fused at 5 amp should be located in a position convenient for easy operation by the user, ie. on the outside of the bedding locker adjacent to the Cascade 2 GE. The mains cable should be connected from the fused outlet to either the RCCB or joined into the existing wiring via a 15 amp junction box. 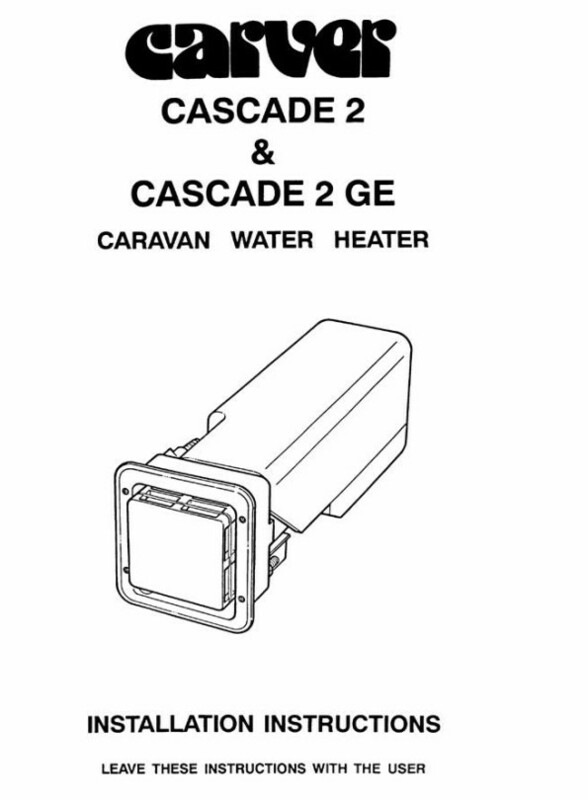 Estimate the length of cable required from the fused outlet to the Cascade 2 GE arid allow extra to enable the heater to be partially withdrawn through the side of the caravan without disconnection. Remove the plate covering the electrical con­nections of the Cascade 2 GE. 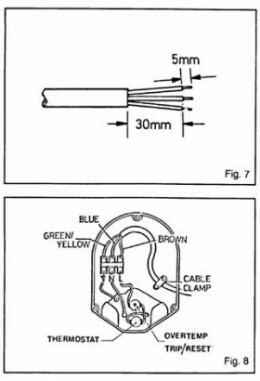 Prepare the end of the cable as shown in fig. 7. Pass the prepared end through the cable entry and under the cable clamp. Tighten the cable clamp taking care not to damage the cable or screws. Replace the cover plate with the 3 screws provided. 10:1 Use ONLY reinforced FOOD QUALITY opaque hose to avoid unpleasant tastes and smells in the water. Note: the reason for the use of opaque hose is that this reduces the possibility of the build up of algae in the system. Connect the cold feed hose for the heater to the existing cold water supply by the use of a 'Y' connector. 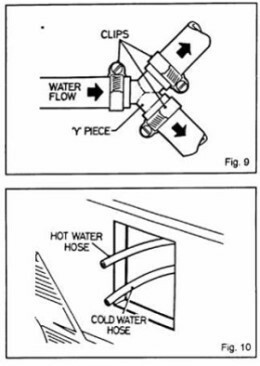 Allow enough length on the hose to make the connection to the heater through hole in the wall of the caravan (see fig. 10). Complete the hot water system allowing enough hose to make the connection to the heater through the hole in the caravan wall. Taps which control the pump by a switch in each tap are considered most suitable but the heater will also work on systems using a pressure switch to control the pump (provided that the pressure operating the switch is below 1 .4bar). Where a pressure switch is used temperature fluctuations can be expected when showering. 11:1 Ensure that the DIN plug is connected to the electronics module at the bottom of the heater. Coat the black flange with a film of mastic to provide a watertight seal with the caravan wall. Push the heater fully home and using the flange holes as a guide drill through the outer skin of the caravan wall with a 4mm dia. drill. Secure the heater flange to the wall by progres­sively tightening the screws to compress the mastic seal. (see fig.12)11:2 Remove any excess mastic taking care not to damage the caravan paintwork. Take note of recommendation made in section 1:0. The 240 volt wall switch should be located in a position convenient for easy operation by the user. e.g. on the outside of the bedding locker. The mains cable should be either directly connected to the RCD or joined into the existing wiring via a 15amp junction box. Connect the heater cable to the fused outlet supply. Clip the cable securely to the caravan structure and ensure that the cable is long enough to allow partial withdrawal of the heater through the caravan wall for servicing. Remove the backing from the wall switch tem­plate and place in the required position take note that the multicore cable is only 3 metres long. Therefore run the cable to the wall switch location before drilling any holes. Drill the holes to the sizes shown on the template. Fix the wall switch with the two screws provided. The DIN plug and socket are keyed so that they will only fit one way. Note: Some caravans are wired with blue as positive (live) so exercise caution on the 12 volt wiring. Ensure that the gas supply is turned off at the cylinder. Connect the heater to the caravan gas system via, an approved isolating valve. The gas inlet fitting is suitable for 8mm or ¼" dia. copper pipe. The 8mm dia. pipe DIN gas fitting should be assembled as in fig. 16. The olive for the 1/4" dia. pipe is symmetrical. It is recommended that a 25mm dia. gas drop hole be drilled through the floor adjacent to where the gas supply joins the heater. When this recommendation is followed the gas feed must be separated from the bedding locker with an enclosure to maintain compliance with the cara­van ventilation regulations. The bedding locker lid may form the top of the enclosure and to give access to the isolating valve. Recheck the installation and where necessary clip any pipes and cable securely. Turn on the gas at the cylinder and at the isolating valve. Switch on the 12 volt supply. Place the pump in a full container of water. Turn on the hot taps and wait until the water flows from the taps, this will indicate that the heater is full of water. 1...Ensure that the gas and 12 volt supply are on. 3...If a green light shows continuously then the heater is working satisfactorily. 4...If green and red lights show after approx. 10 seconds slide the switch to the off position, wait 3 minutes and switch on again.. 5...If green and yellow lights show then the voltage to the control is too low. Recharge the battery. 1...Ensure that the 240 volt supply to the caravan is connected and that the ROD is switched on. 2...Switch on the 240 volt supply to the heater. 3.Wait to check that the water is warming.. When switching on from cold green light only comes on and stays on. Multi-pin plug disconnected at wall switch or heater. Battery condition low causing pump to run slowly. When switching on, green light comes on and after 10 seconds the red as well . When listening to the heater during this sequence a click should be heard followed by intermittent ticking for 10 seconds. Check and charge battery, If not successful. Check wiring. Continuous water flow from cowl when pump is operated Fusible plug blown indi­cating thermostat failure Do not continue to use heater Seek service attention. RCD in caravan tripped Reset and try again. If not successful seek service attention. Site supply not adequate Switch off. Seek warden attention. Switch off and seek service attention. Over temp. thermostat Reset button. If fault persists consult your Carver approved dealer.